I am four now! 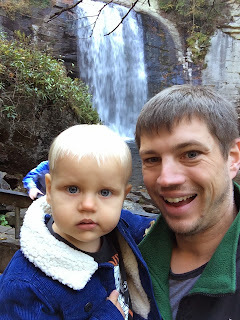 We went to the see the North Carolina mountains over the weekend. We did lots of Halloween stuff there, but I'll save those updates for later. We left on Friday and stopped at Old Navy to get Trent and I new coats (in Charlotte). It was unseasonably cold Then we got to our sleep place, Brevard. On Saturday we did Halloween related stuff. On Sunday we saw Miss Charlotte. She gave me some paints and clay for my birthday. We also went to see a waterfall (my first waterfall). Then we made the long drive home. When we got home I opened my birthday gifts, ate pizza, and then I was forced into bed. We haven't done my cake yet. I think we are going to do that tomorrow.